RAMALLAH, West Bank -- Palestinian President Mahmoud Abbas was discharged from a West Bank hospital on Monday, ending a weeklong stay that drew new attention to the 83-year-old's long history of health problems and his refusal to name a deputy or successor. Wearing a dark suit and speaking in a steady voice, Abbas said he would quickly return to work and thanked supporters all over the world for checking in on him while he was in hospital. "Thank God I'm discharged from the hospital today with good health, and will return back to work from tomorrow," Abbas said. But he hinted that the heavy work load and stress of the U.S. recognition of Jerusalem as Israel's capital had affected his health. Palestinians voice outrage at Trump's "blackmail"
"If I entered the hospital for Jerusalem, I want to leave while Jerusalem is our capital," he told reporters in a brief statement. The Palestinians strongly objected to the U.S. decision on Jerusalem, and the move of the American Embassy from Tel Aviv to Jerusalem this month. The Palestinians believe the U.S. move undercuts their claim to Israeli-annexed east Jerusalem as the capital of a future state, and Abbas has since frozen ties with the Americans. He was hospitalized last weekend with a fever, just days after undergoing ear surgery. Palestinian officials said he had pneumonia and was on a respirator, receiving antibiotics intravenously. Abbas allies insisted he was in good health, but day after day he remained hospitalized, and on Sunday, plans to release him were abruptly pushed back. Abbas, a longtime smoker with weight problems, has a long history of health issues, ranging from heart trouble to a bout with prostate cancer a decade ago. Two years ago, he underwent an emergency heart procedure after suffering exhaustion and chest pains. More recently, a cardiologist moved into the presidential compound in Ramallah to monitor the longtime leader after a mysterious hospital visit in the United States. That visit followed Abbas' address to the U.N. Security Council, in which he appeared weak. The series of health scares have revived anxiety over a potential or even bloody succession battle. 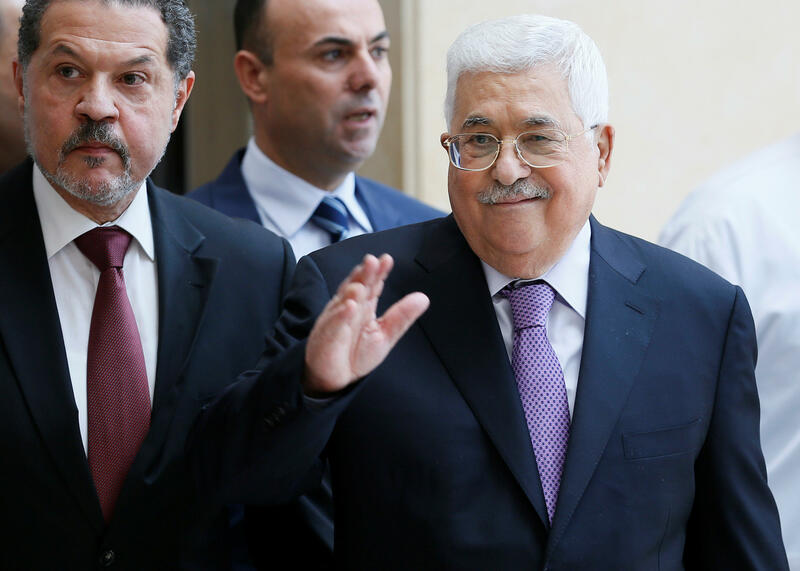 After more than a decade of avoiding discussion of the post-Abbas era, Palestinian officials have cautiously begun to breach the matter in the open, mostly by playing down the crisis, even while potential successors are quietly jockeying for position. "Some are using the president's illness for political gain. Shame on them," said Jibril Rajoub, one of the would-be successors. Abbas Zaki, a top official in Abbas' ruling Fatah party, dodged the question of succession, saying the Palestine Liberation Organization, an umbrella governing body, "will be in charge if the president's post is empty." Abbas took over as a caretaker leader following the death of Palestinian leader Yasser Arafat in 2004, and was elected for what was supposed to be a five-year term the following year. A political split with Hamas - the Palestinian militant group that seized the Gaza Strip in 2007 - has prevented new elections. He has remained in office since then, governing parts of the West Bank. Abbas assumed office with great hopes. Preaching a message of non-violence, he helped end a Palestinian uprising that was going on at the time and pursued peace talks with the Israelis in hopes of establishing an independent Palestinian state. But talks broke down after the election of Israeli Prime Minister Benjamin Netanyahu in 2009, and the two sides have been unable to agree on the terms of negotiations for nearly a decade. The continued rift with Hamas has further hurt Abbas' legacy, and repeated attempts have failed to advance Palestinian reconciliation.